Leishmaniasis is a widespread disease of tropical countries, caused by a tiny parasite that is spread by infested sandflies. When the parasite enters the blood stream (1) it changes form (2) and is ingested by a white blood cell (3). The parasite multiplies in the cell and its descendants may attack the skin (4) or lymph nodes (5). 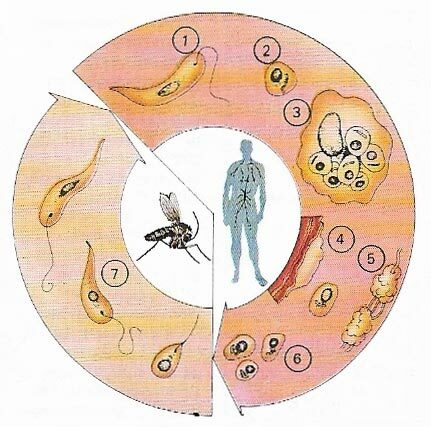 If the victim is bitten by another sandfly, parasites (6) will be sucked up by the insect with the blood and mature into forms that can infect other humans (7). Leishmaniasis, also called kala-azar, is a chronic tropical disease, particularly of the young, caused by protozoa and carried by sandflies; it causes fever, systemic disturbance, anemia, enlargement of the spleen and liver, and susceptibility to infection. It causes a chronic skin condition (oriental sore) with ulceration and crusting, which may also affect mucous membranes of the nose and pharynx.